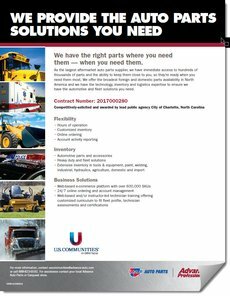 We offer the broadest import and domestic parts availability in North America and the best OE (Original Equipment) premium and professional grade products you need. We also have access to the inventories of import specialists like WORLDPAC® and Autopart International®. Our promise is simple, but strong: Professional quality parts, service and solutions dedicated to the professional. Vehicle fleets are as varied as the many departments and functions they serve, and each fleet has unique parts and service needs that have to be met to ensure safety and reliability. When you partner with us, you have access to the broadest import and domestic parts availability in North America, the best OE, premium, and professional grade products, and years of industry experience. BRAKES: Brake pads that you can trust. The result of more than 25 years of creating quality brake products, Carquest offers superior formulations for longer pad life, improved stopping performance, cleaner wheels and quieter braking. BATTERIES: Batteries built with PowerFrame Technology. Tested. Trusted. Carquest batteries are built with PowerFrame Grid Technology with up to 70% faster electrical flow and up to 66% more durable and corrosion-resistant than other grids. FILTERS: Carquest filters are rigorously tested to ensure reliability and performance, these filters are designed to ensure air pollutants and contaminants are removed to provide optimal function of the engine. ENGINE MANAGEMENT: Engine management is no longer just simple coils and plugs. The category has evolved into numerous complex sensors, switches, valves, and modules that interact with one another throughout the vehicle. STARTERS & ALTERNATORS: Carquest starters and alternators are premium constructed, OE quality parts with industry-leading warranties. With a high level of proven performance and fewer comebacks, these parts meet or exceed OE specifications. 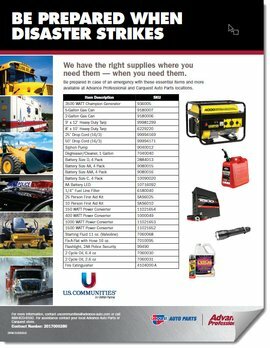 STOCKING CATALOG: The Stocking Catalog offers an on hand advantage that ensures you have the right parts on your shelf when you need them most. Benefits include, regular stock checks, personalized reports showing your shop's top-moving part numbers and competitive changeover programs. You must be a registered participant to utilize this contract. If not, please Register to participate. If your agency is already registered, but does not have an account with Advance and would like to order, a commercial account needs to be created. Contact us or call 888-823-6592. If my agency already has an account, do I need to set-up a new account? No. Contact us at uscommunities@advance-auto.com or 888-823-6592 to have linked to your existing account. Delivery is always free within our defined service network (which includes Carquest Auto Parts and Autopart International) and there’s no minimum purchase required. To view pricing, log-in to your account using your password. If you don’t have a password, please click on request contact and an Advance Team Member will contact you. All pricing discounts are by product line and not tied to national volume. No minimum purchase is required to qualify for the best public sector pricing. What products does this contract with Advance Auto Parts cover? Why should I buy from Advance Auto Parts? Professional quality parts, service and solutions dedicated to your shop.